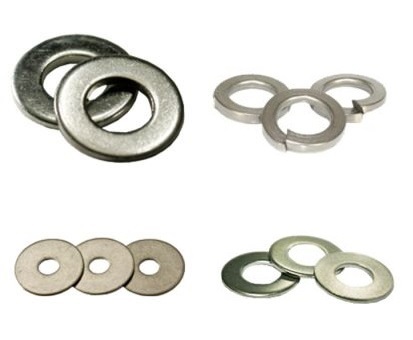 DIN125 Metric flatwashers are a thin, flat, circular part with a centrally located hole with the outside diameter approximately twice the nominal thread diameter of the bolt or screw to be used with it. These are the most common used metric flatwashers with low carbon bolts and screws. Other metric flatwashers available in our Online Store are ASME B18.22M narrow flatwashers thru hardened and A2 stainless. DIN127B metric lockwashers are a coiled, hardened, split, circular washer with a slighly trapezoidal wire section, for use with metric screws. Many more metric washers and lockwashers to come to our Online Store in the near future. If you don't find the washer you need, send us a quick-quote RFQ and we'll be glad to help.